I went back today and am finding it is my favorite Thai restaurant in the area other than My Thai Beach. I have tried a few in the Santa Cruz area and others in Santa Clara, Milpitas, etc. the Pad Thai is great as are the curries and Panang. They could have been spiced more though. Coconut milk in the Ice Tea! Pleasant change from the usual. But the best Thai is The Old Siam in Sunnyvale! I am a vegetarian and I totally love this place… okay, it has a few downsides, but the food is not one of them, imho! I love, love, love the lunch specials, and dinner specials. Coconut soup, yellow or green curries, fresh spring rolls are all delightful, fresh and perfectly prepared, for my taste. Other than Bangkok West ( a totally different experience) this is my fav. in this area. It has always has fast service, and is perfect for that lunch break or quick dinner. My service has always been quite quick and great! The downsides… well, the ambiance could use a little help… it’s drafty by the door, and small and you CAN see the products over on the shelves, plus you have to walk through the kitchen to use the little bathroom.. but for that nice fresh food and low prices, I’ll put up with it all. Aaaannddd, yes, the owner lady is none too friendly but luckily I have had no run ins with her… just your basic service… and I generally don’t look to restaurant staff for personal interaction anyway! If you want cheap, big portioned Thai food in a touristy setting… you will love this place. If you want flavorful Thai food that your Thai friends would be proud to share with their families… you will hate this place. I usually get dragged here by one of my guy friends… dudes seem to LOVE this place… and the best I can figure is that most Santa Cruz guys 1) wouldn’t know the difference between a fried turd and a fried spring roll if their lives depended on it and 2) this place is dirt cheap and bound to fill even the most glutinous male for under $10. That said, unless your limbs had been hacked off in some freak surf fight down at the Jetty and all you had was a few million Zimbabwean dollars left, I would suggest you get in your vehicle and drive a mile or two in any direction to find an infinitely better Thai restaurant. When I lived in SC, I loved coming here for lunch. During lunch time (12-2 or so) they have super good lunch deals. You get soup, rice, a spring roll w/ peanut sauce, and curry for under 10$. I was always a fan of the yellow curry with vegetables and no tofu. They are very versatile here and will listen to what you want. My friend who I would eat here with is a rasta and so his dietary restrictions are a bit more inhibiting than my own, but they always accommodated him nicely. The owners used to be moving around the small dining room and I can see why some people would be disturbed by that, but once you are used to it, they are very nice people and it becomes relatively endearing. I’ve never had anything here that I didn’t like, so try it out and you won’t be disappointed. Do I like Thai Food? Well for the past 3 years I have had it at least once a week and sometimes even two. Did I eat Thai before that? Yes. Am I Thai? No. Have I ever been to Thailand? Not yet. Has my Fianc? Yes? Do I know good food? You bet! Does it have to be authentic? No, it has to taste good. Am I qualified to give an opinion? yelppers! So yelpers, I moved from San Diego and away from my all time favorite Thai restaurant, Siamese Basil. I am now in the beautiful city of Santa Cruz searching for that Thai fix replacement. 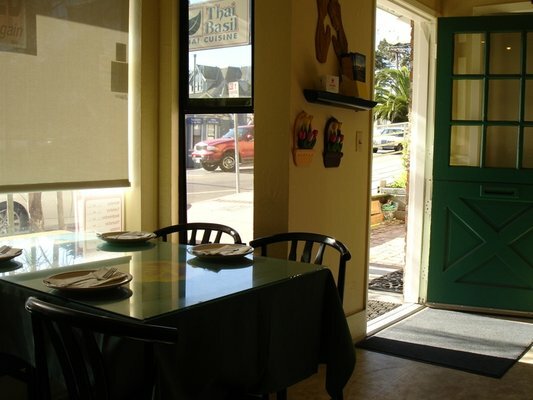 So far in Santa Cruz/Capitola I have been to Sabieng Thai, Thai House, and now Thai Basil. The first encounter-we wanted Thai and we wanted something new. Based on Yelp we called Thai Basil…no answer and a very generic machine. We called back and a woman said, “I am with customer” and hung up on us. Perhaps an accident…who knows. We waited 10 minutes and called back again, the machine. So we waited a few weeks and called back this last Wednesday. We ordered our favorite dishes that I order every time, ummm…because they are my favorite. Green curry with shrimp, extra spicy and Yellow curry with chicken (dark meat if they have it) extra spicy. Now for the bad-NO FLAVOR! Their green curry was borderline okay and their yellow curry tasted as if they used water instead of coconut milk! And I’m sorry, but did I, did I st-ut-ter when I said, “spicy, extra spicy, spicy spicy” -yes folks, I am persistent about my spice! However, I am a problem solver! I happen to have on hand yellow curry and green curry paste and coconut milk. So, I made my own sauce and mixed it with theirs. I have Never had to do this is and I always finish at least 3-4 plates (and I am 5’2 110 lbs..love that Thai! ), but I had a hard time finishing one until I fixed it up. We haven’t been here since our new arrival (now 7 mth baby girl), but in my SE Asian wife’s opinion, this is the best Thai place in town and most reasonably priced, too. Since we were there last, they finally expanded from four tables into the adjacent building (it’s still tiny), so we’re looking forward to squeeze the whole fam in there again soon. After that errant car slammed into the building, they were closed down for a while, and we are happy to see they are back in biz. As for the food, we love the Angel Wings and fresh spring roll appetizers, great Red Duck Curry, Yellow Chicken Curry, and Pineapple Fried Rice. We also enjoy the Pad Thai with duck (did I mention before my wife is a duck freak?). So why not a 5? Because of the seating issues (at least in the past), the sometimes very temperamental owner. She can be the sweetest lady at times, and the most unfriendly b#$%^ at other times. This can also lead to slow and inattentive service. But it’s a small price to pay for great Thai food. You know, the food isn’t really bad. It’s cheap, a bit on the oily side, but not bad. it’s the service that’s a killer. We have had downright rude service here. The owner tries to cook, run credit cards, and take orders all at the same time. and she’s not happy about it, at all. The final straw was when we waited like 40 minutes for her to run our credit card and walked out not only frustrated but with a parking ticket on our windshield. do yourself a favor, go up the road to star of siam. This place was just alright. The pad thai was really saucy for some reason. It wasn’t a bad thing, but a little different than other places. Red curry was pretty good. Nothing amazing, and definitely not worth the 2 hours of horrendously rude service I witnessed and the 30 dollar parking ticket. All metered parking, watch out for the wheelchair cops, they ticket like hell. My friend and I sat there wide-eyed and scared shitless to ask for the check. Don’t get me wrong, I am used to snappy and rude middle aged asian women and I used to work at a Thai restaurant. But her attitude seriously scared me as a customer. Took maybe 45 minutes to finish our meal, but another 30-40 minutes just for her to notice to get us the check. Again, we were the only customers in there. If you can handle erratic and snappy service from a bipolar frowny asian woman, it might be worth it for you. This entry was posted in All Capitola Restaurants, Capitola Thai Restaurant Reviews, Uncategorized. Bookmark the permalink.